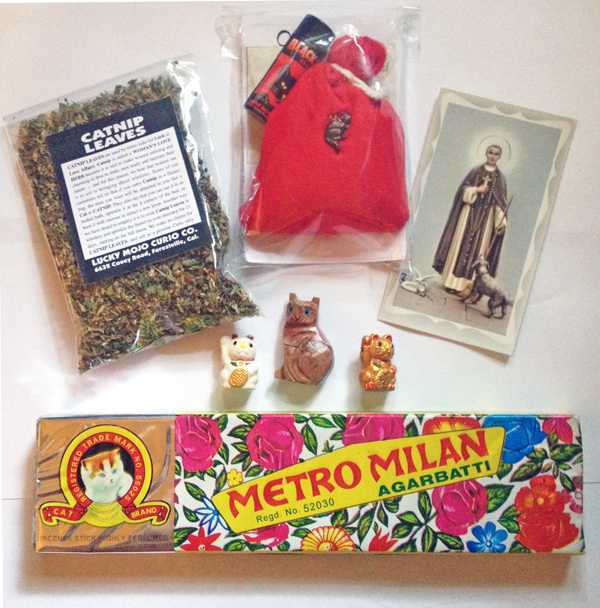 The Lucky Mojo Curio Co. is hosting a random drawing to give away 1 VERY BIG spiritual supply prize for your beloved kitty kat. This week one lucky winner will receive a multicultural bonanza of Cat-Witchery -- a Triple Strength Jackie the Cat Mojo Hand with Black Cat Oil, for the health of your kitty; a bag of our finest Lucky Mojo brand occult-shop grade Catnip; a carved Peruvian soapstone cat amulet; two Japanese style Maneki Neko Ceramic Lucky Cat Beads, one white for good health and one gold for good fortune; an Italian Catholic holy card of Saint Martin De Porres, the Patron of Veterinarians and Domestic Animals; and a package of Pakistani Metro Milan Cat Brand Agarbatti Incense to purrrrfume the air of your home sanctuary. Thanks for posting this, Ernie. We have a winner! In fact, we have 1 big lucky winner! Our Facebook Fridays! winner for July 13, 2018 is: Yvonne Disher.